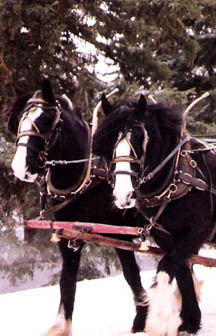 For over a century, Alberta has been home to a succession of great Percheron sires. 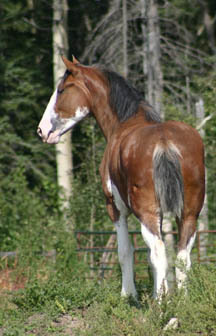 Halifax, the French-bred stallion was purchased by George Lane for the Bar U Ranch at Longview, at Winnipeg’s 1909 Industrial Exhibition, where he was Supreme Champion over all breeds. 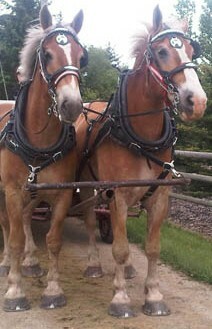 Lane considered Halifax the best sire ever stood at the Bar U, the world’s largest Percheron breeding operation ever. In 1920, the Alberta Government purchased Job, a French import, that was the Reserve Grand Champion Stallion at Chicago’s International Livestock Exposition, for $8,000. This 2,400 lb. 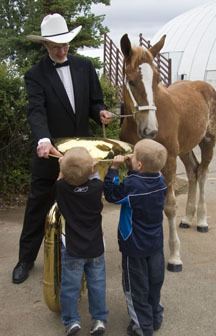 sire stood for public service across Alberta for over twenty years. 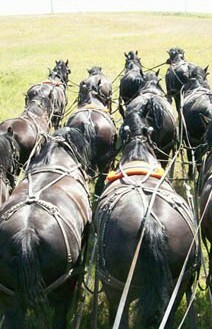 He did much for the Percheron breed in the province. 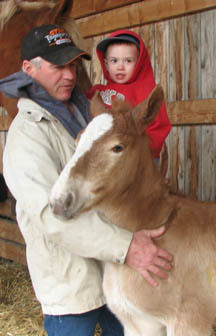 A daughter, Princeton Carmen, bred by H.R.H. Edward, Prince of Wales, at the E.P. Ranch, Longview, was shipped to England. 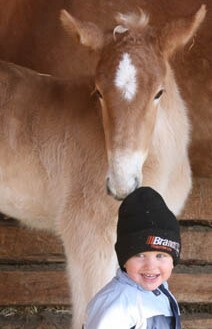 Ryan Day Flash’s Jordan, Alberta’s $50,000 Percheron Sire. 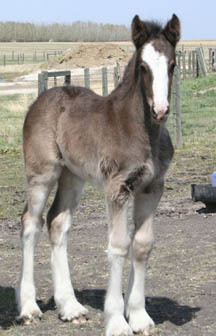 Perlaet, a son of America’s celebrated sire, Laet, was purchased by nine farmers from Hussar, at Chicago’s 1925 International Livestock Exposition. 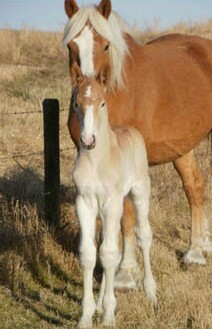 They wanted a superior breeding horse in their district. This magnificent, 2,180 lb. 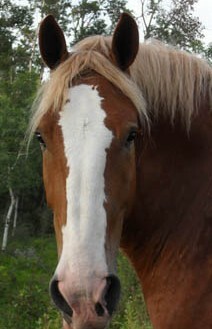 stallion, bred a hundred mares each spring, until his death in 1932. 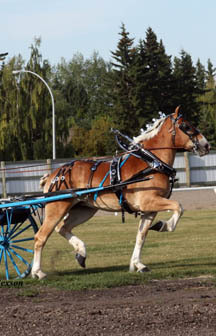 His offspring included Starlight Laget, Champion Canadian Bred Stallion at Chicago’s 1933 International Livestock Exposition for Quebec’s National Breweries and Ebony Rose, the honour laden wheel mare exhibited by Greenway & Clark of Acme, for years across Western Canada. 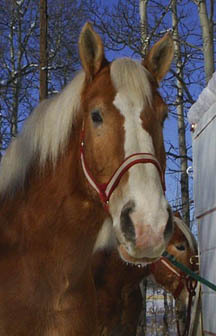 During World War II, the McIntyre Ranch at Lethbridge, brought Milaet, another Laet to Alberta. 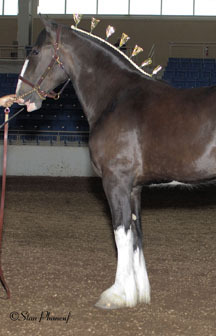 This honour laden, Ohio-bred stallion sire also bred in Alberta with considerable success. 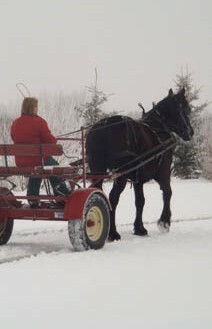 In the 1950’s, Agriculture Canada stationed two exceptiona Percheron stallions at the Federal Experimental Farm, Lacombe. 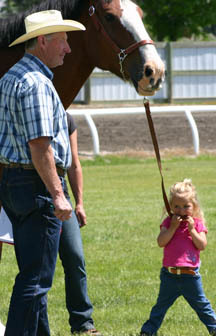 Koncarhope, a sire bred in the state of New York, was followed by the Manitoba-bred sire, Riverbend Monkoncarlaet. 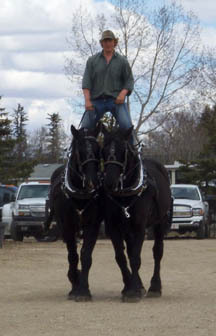 Both Percheron stallions bred with inordinate success. 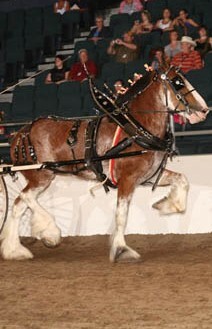 Their Alberta-bred offspring topped Canada’s Royal Agricultural Winter Fair year after year. 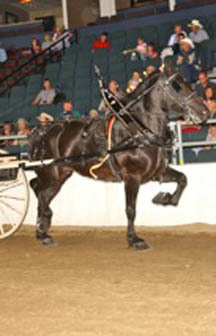 Today, Justamere Showtime, a Riverbend Monkoncarlaet son, is recognized as the architect of North America’s modern Percheron horse. 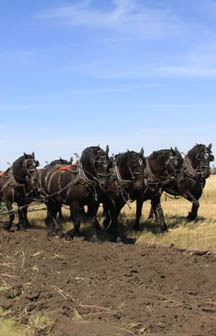 His countless descendants can be found in nine Canadian provinces, throughout the U.S.A., in England, Australia and France, the home of the Percheron breed. 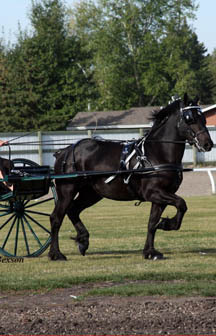 Six Percheron breeders in Alberta and British Columbia, who are known as the “Six Pack,” bought the Ontario-bred colt, Ryan Day Flash’s Jordan, the Reserve Grand Champion Stallion at Toronto’s Royal Agricultural Winter Fair, three years ago A superb athlete, this heads-up horse, with bottoms, bone and body, is capturing the interest of Percheron breeders across North America. 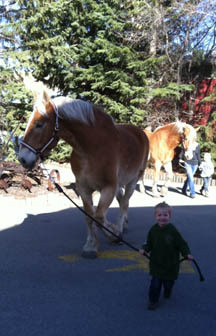 To date, his exciting offspring suggests he will be still another of Alberta’s celebrated Percheron sires.